Gileboom homestay is located in Ghasem-Abad village in the eastern part of Guilan province. Considering the natural, cultural, and architectural attractions of this village and the nearby region, Gileboom conducted a wide range of programs and activities. Ghasem-Abad is a traditional village of Iran, located in the east of Gilan Province, in Chaboksar, a district of Rudsar County. It is subdivided into two regions: Ghasem-Abad-e-Olya (upper Ghasem-Abad) and Ghasem-Abad-e-Sofla (lower Ghasem-Abad). Ghasem-Abad is a nice place for walking activates. Strolling along rivers and rivulets, through vast rice paddies, forests, tea farms, kiwi and orange gardens creates an excellent opportunity for rural tourism. The Antiquity of Ghasem-Abadi dress dates back to fabrics found in Marlik hill. The designs on skirts and dresses are the same as those discovered in Marlik hill. The dress had a specific design in a way that if somebody sees a woman in an alley or on a farm, can realize that she is single or married, has child or not, is old or young. Also men can be identified as being single or married through the lines on their pants. Ghasem-Abad’s songs and music are famous in Iran. Ghasem-Abadi dance is inspired by farming tasks performed during rice plantation and harvest. This dance is often performed in weddings and festivals. Rice cultivation, tea plantation, producing flowers and citrus fruits, animal husbandry, fishing and producing handicrafts such as Chadorshab and felt are the major sources of income in Ghasem-Abad village. The Hyrcanian mixed Forest, Sarve-Lat protected area and the diversity of trees and plants make the village an extraordinary place for hiking and walking. 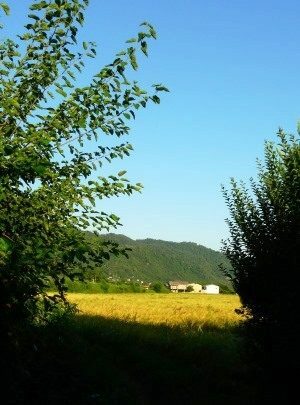 A rainbow of leaf colors in the foothills in autumn and vast greenery in spring and summer create a unique landscape in the village. Beautiful plants and saplings grown in the plant nurseries created by village men and women are exported to other cities and regional countries. The rural women can be seen working in the terraced rice fields and tea farms, wearing colorful Ghasem-Abadi dresses and Chadorshab (a traditional hand-woven fabric) that attracts attention of any tourist. It lasts about half an hour from Gileboom homestay to the Caspian Sea by walk. The beech is sandy and you can watch groups of fishermen catching fishes from early fall till spring. This beautiful beach is a great place for swimming and sailing while enjoying a beautiful view of jungle and the snowy Somamous peak (3700m). For further information about swimming in the Caspian Sea regulations, you may follow these links: Swimming in Iran (lonely planet, thorn tree form) and Regulations of swimming (travel stack exchange). Gileboom activities are organized in cooperation with the local community with the aim of preserving the local art and culture and helping with sustainable development of the region. 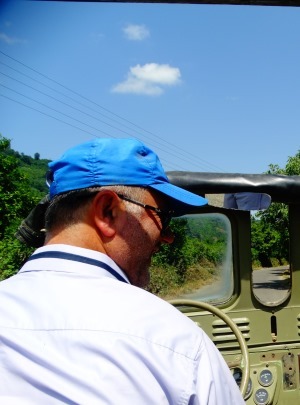 Depending on your personal preference you can experience different activities: walking and hiking tours of jungle and mountains; home visit to local artists and craftsmen; Jungle Safari to Javaherdasht summer region; visiting tea factory, working at farm, pottery (known as sofalgari) and sculpture making, Orange-picking, wood turning. Eastern Guilan is famous for its variety of Handicrafts including; Feltmaking, Chadorshab-Weaving, Pottery, Bamboo and mat weaving, Woodturning, sculpture making, even Making Carpet. Handicrafts play an important role in the tourism industry. 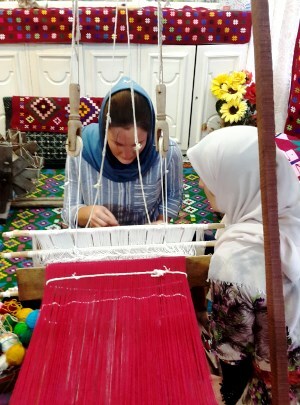 When you travel to a country like Iran which is famous for its handicrafts, visiting workshops and artisans is one of the things to do. It might be interesting, the thing happened to us; after visiting Mahtab Suzanduz who was a world famous needle worker in Sistan and Baluchistan Province, we decided to start a new chapter in our lives and give local artisans like her the recognition they deserve and what you see in Gileboom homestay is the result of that handicraft visit. In Gileboom we provide the local community an opportunity to showcase and sell their hand-made products and crafts. The Products made by hand each have a story of their own and each crafted item, shaped, reshaped and mastered carefully results in unique art pieces that are slightly different from the other because no two handmade products can turn out exactly the same. You can still find some, still being used in our daily lives today. Hiking Alborz Mountains is in the wish lists of most travelers coming to Gileboom homestay. Gileboom offers a wide range of hiking activities in Ghasem-Abad village and other villages around; all of these hiking programs are done in the Caspian Hyrcanian Jungles and Alborz Mountains to explore villages at high altitude and Hyrcanian trees and have a great view over plain areas including rice fields and tea farms. The Alborz range skirts the south of the Caspian Sea, almost 900 km long, stretching from the Azerbaijan province in NW all around to the Khorasan province in the NE, creating a natural barrier between the dry and hot plains southwards and the green Alpine forests northwards. Its width ranges from 60 to 160 km; and the range is divided into Eastern, Central and Western Alborz. Guilan province is located on the West part of Alborz Range. Gileboom programs for the hiking Alborz Mountains vary from half-day to one- day hikes. 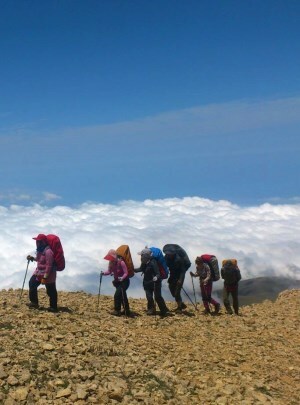 The highest altitudes of hiking programs do not exceed than 830 m and the difficulty level is from Moderate to Difficult. 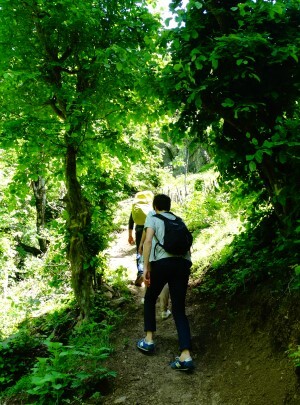 The word “hiking” here means a long, vigorous walk, on trails or off trail, for recreational purposes; as it is preferred term in Canada, the United States, and the UK. The term bushwalking is endemic to Australia, having been adopted by the Sydney Bush Walkers club in 1927. In New Zealand a long, vigorous walk or hike is called tramping. It seems that you are just going to stay here and relax, drink tea, and read books at first by reaching Gileboom and staying in its cozy rooms; but the pretty landscape around the lodge, breathing fresh air, and great activity maps will not let you just loll here, walking in rural lanes and strolling in the hinterland is the first enjoyable activity to do here. You can walk to the Caspian Sea, the world’s largest lake, and enjoy sandy beach – which is a great place for swimming –and sale there while enjoying a beautiful view of jungle and snowy Somamous peak. From early fall till spring you can also watch teams of fishermen catching fishes there. You may also pick the walking maps and move towards Eisal-Kool, the rice fields and reach the Sal (water reservoir for rice planting), tea and kiwifruit farms and a plant nursery where hectares of ornamental plants are grown neatly by the owner and rural men and women are working there. Mish-Sere Dasht is another option, which means ‘sheep pasture’ in Gilaki dialect. The plain is full of Kunos trees (gilak term for wild medlar trees) so you can eat the fruits in late fall and winter.